About three years ago, I purchased my first cashmere sweater from Ann Taylor. For most of my life, I had the misconception that cashmere was itchy. After I discovered how soft and comfortable they are, cashmere sweaters are now my favorites. One good dark color one can take you through the whole winter, as I am about to show you. The one I am wearing here is a couple of years old. When I purchase another one, it will likely be navy or charcoal gray. Any dark neutral color will serve you well. A similar black one is here. The black booties are here. The jeans are here. I wore the look above while working at home yesterday. When I had to run out to do a couple of errands, I put on some jewelry, a scarf, gloves, and a coat. The Dooney & Bourke Light Taupe bag is here. Similar red leather gloves are here. A similar gray wool coat is here. The scarf is from my online shop here. The new coated jeans in Deep Merlot are from Chico’s here. The same scarf relates to the colors of the sweater, the jeans and the Bordeaux Dooney & Bourke bag here. You can see from this photo that the sweater is longer in the back than in the front. 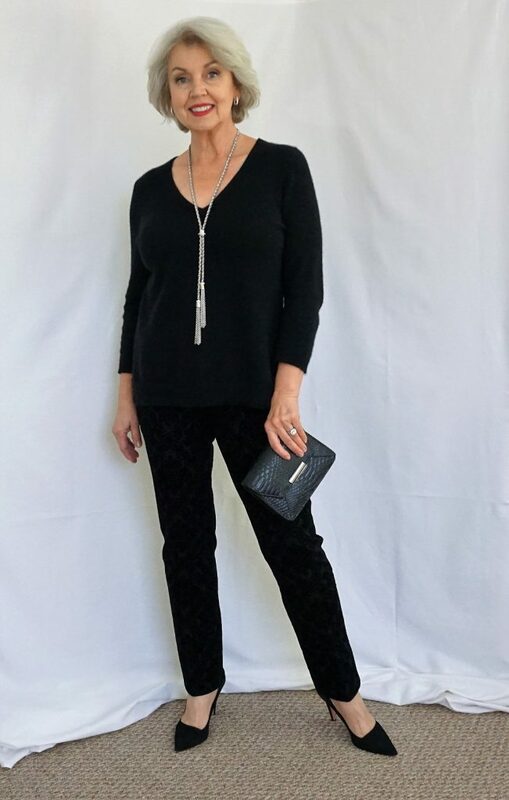 Wear the same sweater with the Juliet Flocked Pants (here) and long silver necklace (similar here) and small crystal earrings (here) to create a lovely evening look. Similar black suede pumps are here. A similar evening clutch is here. 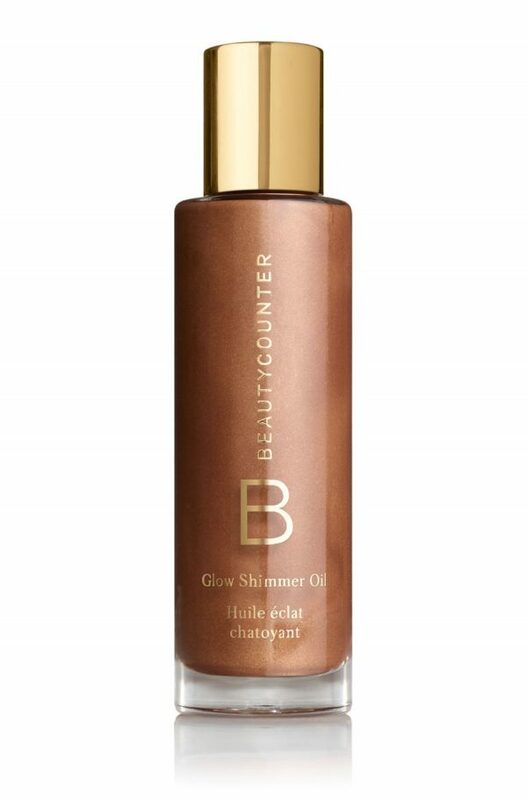 I call this “Silk Stockings in a Bottle”… Beautycounter Glow Shimmer Oil is here. I put it on my feet and legs when I don’t want to wear stockings because some shoes won’t stay on as I walk in hose. The basic black sweater can also be edgy and urban. (The sweater shown is much longer in the back than in the front.) I paired the sweater with my Levi’s jacket here and black leggings here. The Ralph Lauren bag is here. The tourquise earrings are from T.J. Maxx. Similar here. 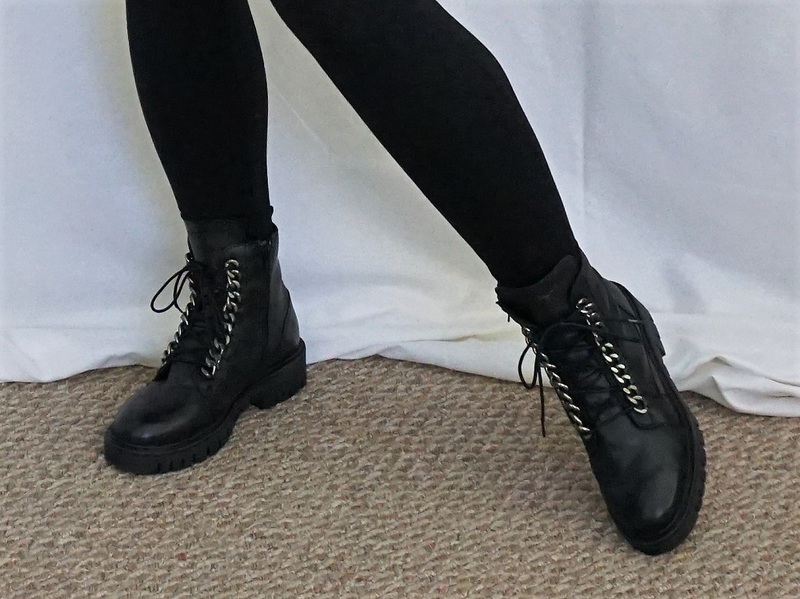 The new Brusque Combat Boots are from DSW (similar here). When it snows, I’m all set with the proper boots now! If I need to layer further, I can drape my Everlane gray wool jacket (here) over my shoulders or wear it over the jean jacket. The beauty of neutral colors and classic flattering shapes is that they can be worn in so many ways and for several seasons. In the video below, I show you a few ways to tie and drape fifty-one-inch silk scarves. My sincere thanks to Elizabeth Miller for stopping by here on her way home from school to help me take these photos and the video. We enjoy doing these ‘How to Wear it’ posts for you. Let me know in the comments below which basic you would like for me to cover next. I love hearing from you! Great post. So many good ideas. Please review flat shoes and which styles and stockings go with which types of outfits! Thanks for your blogs and videos! Love your blog. Devour each post. Recently began streamlining my closet to only contain clothes that I love and that can be mixed and matched. I would like to see a post for holiday dressing…(i.e. what do you wear when the invitation says holiday cocktail, holiday casual, etc). Just love your blog – has helped me so much . I know you have talked about it before, but always looking for ideas on how to dress everyday, staying at home, or just running a quick errand. Also, I have become of fan of very small purses, no longer carrying a lot with me. Ideas? Thoughts? It was a terrific way for me to see the whole picture of this great sweater. It takes the expense initially of such a sweater, and the guilt lol, and points to the incredible utility you achieved with it. The evening outfit and the jean jacket outfit are my favorites. Thanks! You look very nice in everything. You also have a flattering shape. I have a larger stomach and small chest. You may have an apple shape, Cindy. Tops and dresses with an empire waistline will look good on you. I enjoy seeing your posts about ways to wear basics. Even though I know and have worn many of your styling examples, your posts serve as a reminder to me. Your posts are like an updated, ever-changing Pinterest page. Thanks for your time and dedication to post and your transparency to share. I’m with Cindy D. on wanting to know what to wear for those special occasions. There are always some of the same people attending. I sure would like to look spectacular without having to purchase things I’ll only wear once, which has been my usual way. You look so chic! I like your idea of wearing a jean with a dressier finish to achieve a special look. I did buy a pair of velvet jeans recently to help achieve a less casual look. I have several ballet neck cashmere sweaters and love them! They are comfortable and I wear them all year round. Love all the looks with only one top! Your many interesting ideas and suggestions caused me to stop and rethink my situation. After abdominal surgery left me with a closet full of clothes I couldn’t fit into, since there is now a two or three size difference between my upper and lower torso, it occurred to me that I might reverse my tops. I was able to use the extra fullness through my waist and hips, especially true now with the backs of tops slightly longer to cover the derriere. Is it a perfect solution? No, but I am at least able to salvage some of my wardrobe. I am interested in non stretchy, non fitted items for my wardrobe, but that style is not easy to find in today’s fashion market, I think. I love this post. Every outfit looks very polished, pressed and put together. May I ask you where did you get your fabulous gloves? I can’t tell exactly what color they are red or more of orange color but they are beautiful. Any tips regarding gloves would be greatly appreciated. The gloves are indeed red leather. Click on the link in the post to see the most similar style I could find. 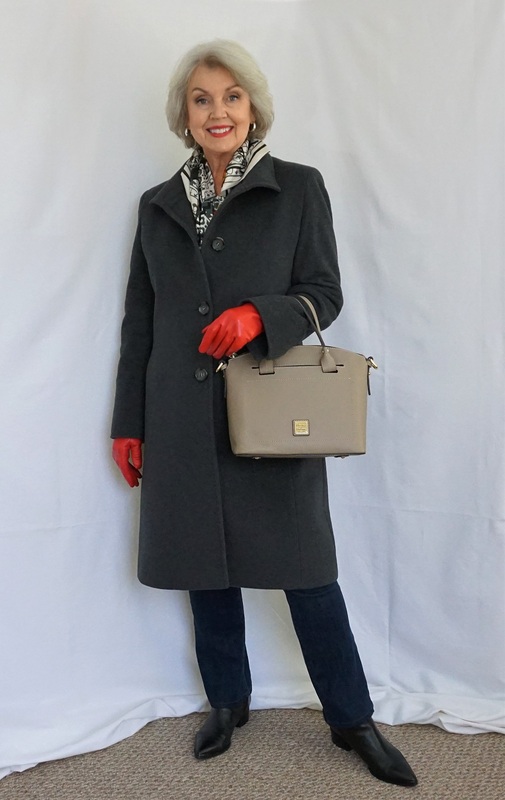 I use gloves as a unique pop of color, or I relate them to some other accessory in my look such as a scarf. Really like the “How to wear it posts” seeing how versatile a piece is and all it’s different looks at once is great. Would love to see more. Happy Holidays and Thanks. Great post! I have a burgundy cashmere sweater and a gray crew neck sweater. I noticed a small hole appearing just below the neckline on the gray one. Do moths eat cashmere? I am so sad! Love how many ways you can wear a sweater ! Merry Christmas! Yes, the larvae of moths do eat cashmere. Always clean your wool and cashmere items before storing them. Moths love cashmere. Sometimes they come from the store with larvae in them. I immediately put a new sweater in the freezer for at least three days to kill the larvae. After that, they are stored in the freezer when not wearing. My husband says we would have room for food, if I would keep my clothes out of the freezer. Loved today’s post. Lots of information that can be used every day. I never get tired of seeing how you style leggings and tunics with flats and boots. Seeing how that works with a jacket, short coat, and/or poncho would be a bonus. This is a great post! 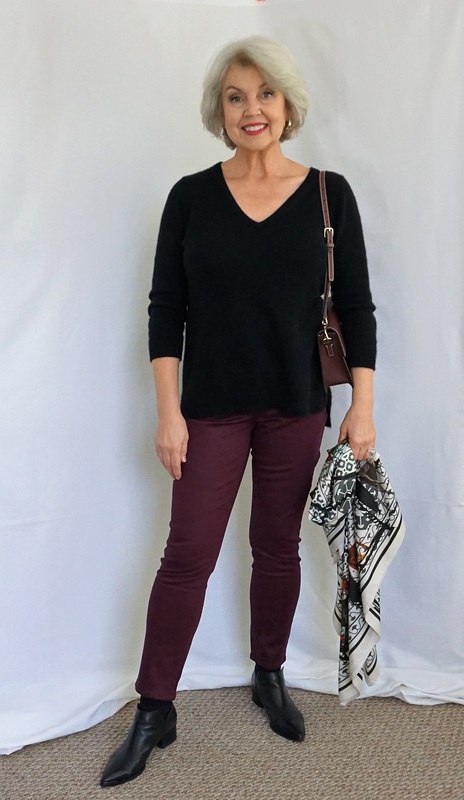 I have the Chico’s Travelers Classic Crystal V-Neck Top that is similar in shape to the cashmere sweater you are using to style the different looks. Boy, I didn’t realize all the ways I can wear that top! I have only worn it for dressy occasions with black pants. See, you’ve opened our eyes to the versatility of basic pieces. 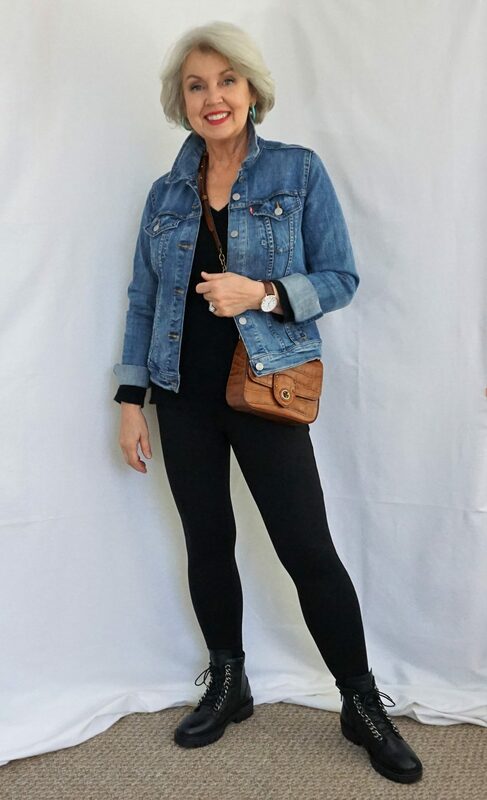 How about a post on using summer pieces in fall/winter? 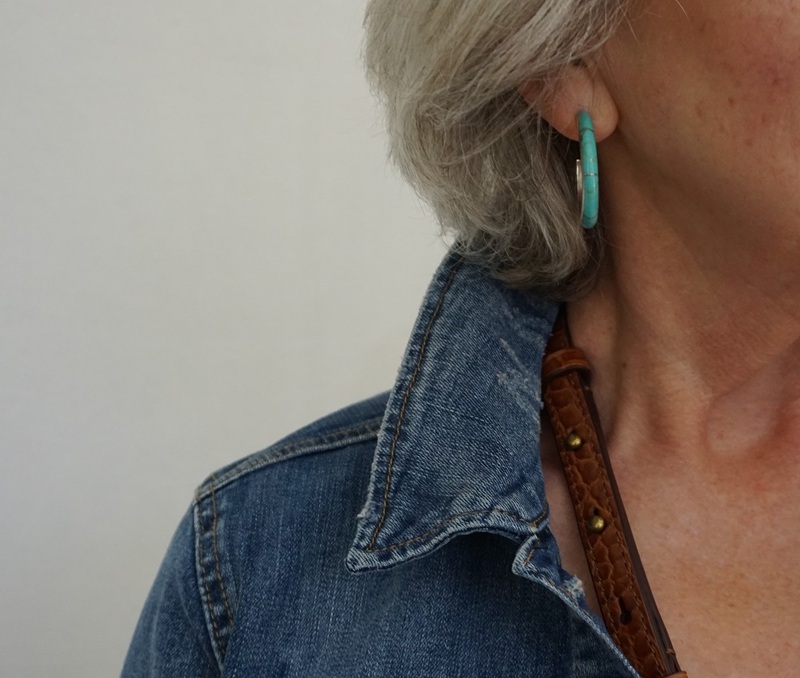 I’m thinking of sleeveless shells — can they be used to layer OVER long sleeved tops? Would love to see what you could do with them. I’m ordering that scarf today. It’s one I would never have chosen had you not modeled it with grey & burgundy. When you said there was a blue version, I checked my closet and realized I had worn that one this morning. Your silk twill scarves have made dressing appropriately and stylish, both quick and easy. Thank you Donnella. I’m surprised by how many of my tops and jackets that neutral scarf complements. These are wonderful tutorials, and it’s great how you answer your readers’ questions in such detail so that everyone benefits. Cardigans are something I would like to see styled with accessories. I rarely wear them but recently bought one and was pleasantly surprised. For those who can’t wear any type of wool I think your basic tops from your store would be a good substitute. Thank you for the good suggestions and ideas. Those crepe items are so comfortable and versatile. You hit on my fall & winter favorite – cashmere sweaters. They are my go-to wardrobe — turtleneck, jewel neck, round neck, v-neck. Over the years I’ve collected black & brown & all of the jewel tones — burgundy, green, purple. I’m never cold or uncomfortably warm in cashmere. And, no itchy wool; just soft comfort. You may have covered the topic before or in one of the comments I missed but can you explain what you mean by “coated” jeans? I love your how-to’s. Perhaps sometime you could show us what you carry in your purse. I love purses & you have given me permission to keep all of mine! Coated denim begins as regular denim fabric, but undergoes a manufacturing process to give it a shiny, wax-like finish. Coated jeans are sometimes referred to as wax jeans, but no wax used in the process of making them. I live in Chicago and absolutely LOVE cashmere. We have 6 months of cold weather so I get to wear it a lot. 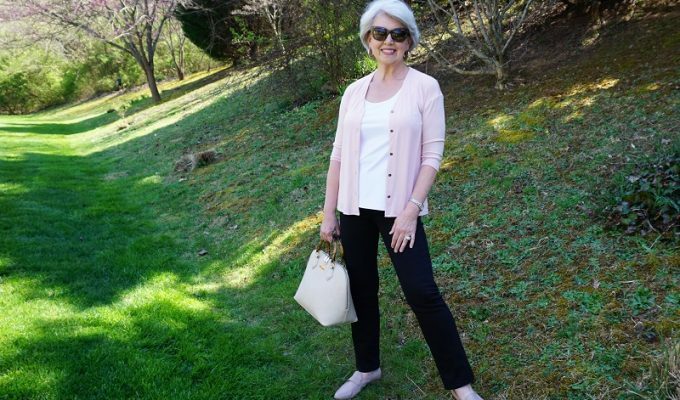 Love how you’ve styled the cashmere sweater with a number of items! I enjoy your blog every time, but these posts about different ways to wear a particular item are very helpful. Susan: I love your scarves and recently bought one. It’s gorgeous. Can you talk a little about the size of the scarves and short women. I find that the 51” scarf is just too large for my 4’10” body. When I roll up a scarf that size, it hangs down below my knees! What are some scarf sizes that would work better for me? Thanks much. Keep wrapping the rolled or folded scarf so that it is shorter or try a scarf that is only 40″ across. Appreciate the scarf tutorial. It was very helpful. And I love your first four looks in the panel above! Are you getting away from French Kande? I have the scarf and I absolutely love it. Thank you Susan for showing me a few more ways to wear it. I’m endlessly impressed with how much you come up with to tutor and inspire us! Thank you for all the great details and practical guidance. 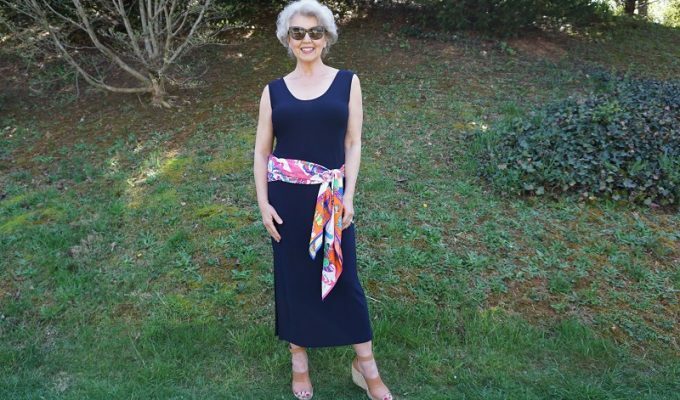 I have a black V-neck cashmere sweater very like yours, Susan, and these ideas, plus scarf tips, have expanded my wardrobe for free! Thank you! L.O.V.E. this!!!!!! 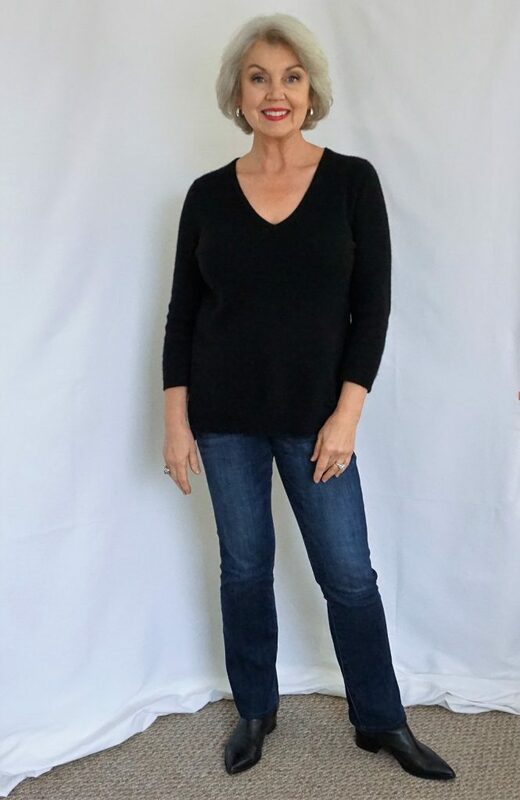 I adore a classic, black cashmere v-neck sweater – a fabulous basic item in my own wardrobe. I am so happy to see you pay homage to this intergal piece of any wardrobe!! Thank you, Susan, well done! this was wonderful. I never think to wear my jean jacket this time of year. Everything you show us is so perfectly put together in just the right way. What fun it is to open the link to your blog! I loved this blog post. Thanks again for taking the time to post. I know it is work! I especially like how you showed the different looks, side-by-side at the bottom. Are you growing your hair out? It always looks great, but looks slightly different from a month or so ago. I would love to see a post about the do’s and don’t of posing for holiday photos! Your basic dark sweater post was one of the best ever…. real good outfit combinations. And putting all the photos in a row allowed me to save them together for future reference. Thanks for some really good ideas! These looks are nice. Just right for the seasons which call for layering. With a change of bag and accessories this will take my closet a long way. Could you do a video on basic shirts such as the White Shirt and Tee shirt and how you’d layer and accessorize those? Thanks so much. I enjoy your blogs. You always look so great! thank you for being such an inspiration for simple yet beautiful fashion. 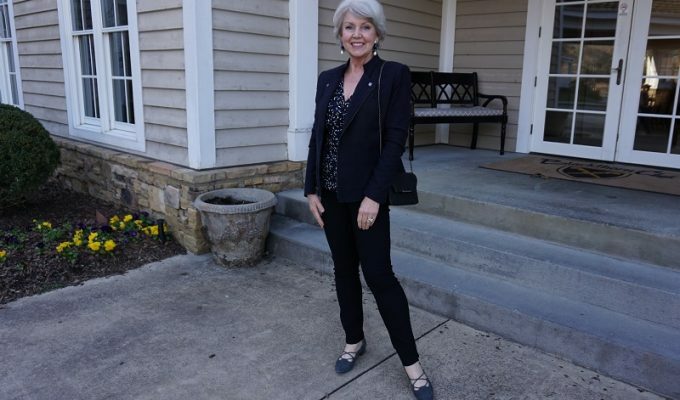 Hi Susan…..love your blog and certainly agree with the concept of a “uniform” of basics and the addition of accessories. I am 79 and am told I look and act 10 years younger. My winter basic, instead of a “V” neck is a turtleneck because I live in Canada and one needs to keep one’s neck warm. I too wear many different scarves to keep warm and add colour. I do however, wear “v” necks as a rule. However, as much as I love your style, I do wish sometimes you would break out of the box and wear something a little on the outrageous side; perhaps a gorgeous long skirt or a lovely slim line caftan for after hours and entertaining. I get your feelings about trousers but sometimes one needs to totally surprise everyone………I think you would look gorgeous in something like that. Many of my friends also follow your blog and it’s comforting to know you can look fashionable at any age.